Hi, my name is Jean. I am an upcoming sophomore at Promise Academy. I am a new student at BlueStamp and am new to engineering. Over the course of this 6 week program, I completed two projects, One main and a starter project. For my starter project, I made a MintyBoost Phone charger and my main project is a MicroWind Turbine. Over the course of this 6 week program, it was a struggle, but it was fun and great. On my first day here, I learned how to solder which was essential and important for both of my projects. My starter project, I had little difficulty soldering but I overcame my challenges and successfully finished my project. My main project was difficult because it involved mechanical building which I never experienced prior to this program. I learned how to solder and it was a new experience as well. I recommend this program to someone who is new to engineering or wants to learn more about engineering outside of class. My addition to the Micro Wind Turbine was that I transferred my components to my Printed Circuit Board(PCB) because it would make holding the turbine easier and more portable. Also, transferring these components to the board made them more stable and secure because they are soldered on. Jean's First Milestone – Micro Wind Turbine! For my starter project, I have made a MintyBoost Portable charger. In order for the project to work, any phone needs five volts to charge. However, the two double A batteries give off three volts and other components are needed to convert low voltages to high voltages. The AA batteries act as the power source for the charger. The batteries are connected to the Printed Circuit Board which contain the rest of the components.The first item I had to solder in was a 3.3 k resistor. These resistors are responsible for controlling the current flow. Next, I had to solder in my capacitors. The two types of capacitors that were used were ceramic and electrolytic. The ceramic capacitors filter out high frequency noise and electrolytic capacitors stabilize noise and controls the voltages coming in and out. The diode is used for current to pass in one direction only. Lastly, the most important part of this project was the power inductor along with the boost converter chip. The chip essentially acts like a switch and when the switch is on, current passing through the inductor stores magnetic energy and when the switch is off, current is released to the capacitor and electrical energy is stored. This process of switching happens a lot of times until the voltage is raised to 5V. 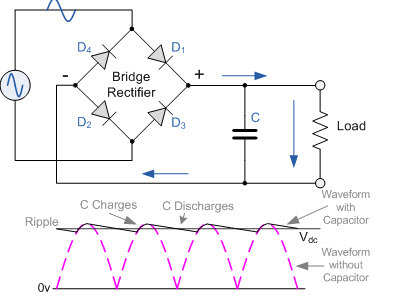 Once 5V is reached, it maintains that voltage by repeating this process. The schematic below is the circuit used in the MintyBoost phone charger. Jean you are a natural! So articulate! Great work!